Many years ago, I became interested in brass band music. I loved the sonorous sound made by brass instruments. When I joined the Rockville Concert Band in 1973, I looked for a brass band that I could also play in. The only brass band in the Washington area was the Salvation Army band. I wasn’t comfortable at the thought of playing in a religiously-oriented band. I wasn’t interested in taking the lead in forming a new band, but after several years, I decided to “bite the bullet” and start a band. I discussed this idea with the brass players in the Rockville Concert Band. Seven of them expressed an interest. So, on March 6, 1976, the Rockville Brass Band had its first rehearsal. The City of Rockville offered to assist us by providing a rehearsal space. This was in the music room of an elementary school. Because of the limited size of the band, we began by playing brass quintet music. After a few weeks, we recruited more members and began playing brass band music. At this point, I had to make a decision. The lower brass parts, except for the bass trombone, were arranged in the treble clef. I was had to decide whether to try to force our lower brass players to learn to read treble clef music or transpose the parts into bass clef. Knowing how hard it would be to force players to convert and all of the other groups that they could play in, I decided to transpose the parts. We outgrew the small music room and moved our rehearsals to Parkland Junior High School. The band director there played trombone with us for several years. It was necessary to find some music to play. Fortunately for me, Dale Music in Silver Spring had tried to create a market for brass band music, but hadn’t succeeded. They offered to sell me a copy of every piece they had down in the basement for $20. This turned out to be quite a haul. I didn’t have much money, but I couldn’t refuse. I took home a box of music and began to transpose the parts by hand. There was no software to do this at the time. For the next 25 years, I spent thousands of hours transposing parts into bass clef. The first three years were very hard. I had to call members every week and beg them to come to rehearsal. There was a frequent turnover in the players. This meant that we were in an almost constant state of trying to “catch up” in the level of our ability to play the music. We also needed a conductor to help us become more proficient. We didn’t have enough money to pay for a conductor, so I looked for a volunteer. The first volunteer I found was Philip Jehle (pronounced “Yea-lee”), a clarinet player in the Rockville Concert Band. He was looking for the experience of directing a band. He was with the Montgomery County public school system. He went on to become a middle school band director. He was our director for about three years. Our next volunteer director was Richard Fazio. His primary musical interest was in choral music, but he did a great job in directing the band. In 1982, Richard left us. Also, the county began to charge for the use of school facilities. These two events caused us to begin rehearsing at a local Presbyterian church. After a few rehearsals, Mary Jane Lynch, one of our cornet players, suggested that we ask Dr. Ernest Wolfle (pronounced “Wolf-lee”), a professor of music at Montgomery College, if he would be interested in conducting the band. He came to hear us at one of our rehearsals at the church. As a result, he suggested that we move to the college and become one of the ensembles in the music department. He agreed not to charge us a fee for conducting, but at least twelve of us had to register as students and pay the tuition to justify the existence of the band within the department. He provided a great deal of music for us to play and even bought some instruments that we did not have, such as English baritones. Our title was changed to the Montgomery County Rockville Brass Band. He was our director for eleven years. Tension developed between Dr. Wolfle and other faculty members of the department. They felt that they were wasting resources on the band, and that it didn’t represent a justifiable expenditure of college funds. At the first rehearsal of the 1993-94 season, we were informed that Dr. Wolfle had suddenly decided to retire, leaving the college in the lurch. They arranged for Charles “Bud” Caputo, the music supervisor for the Montgomery County school system, to conduct us. “Bud” had been the director of the Washington Redskins marching band for many years. He became our director for the next two years. In 1994, the music department decided that, if the band was to continue to be a part of the college, all members would have to pay tuition at the adult education rate, which was significantly higher than the regular tuition. That forced us to leave the college. One of our Solo Cornet players was the music director at Columbia Union College. He offered to host the band and told us that he was interested in brass band music and had leased a complete set of band instruments from Boosey & Hawkes. So, we moved to the college for the next two years. For the first year, we had six alto horn players, the only time that this occurred in the history of the band. After the second year, the Solo Cornet player got married and resigned as the music director. The college let us know that they could no longer host us. One of our Euphonium players, Chris Campagna, was also the band director at White Oak Middle School. He offered to host us at this school. “Bud” Caputo had told me that he was quitting as our director and suggested Chris as his replacement. Chris accepted my offer and became our director for the next two years. At the end of the second year, he told me that he could not continue as our director. He was planning to go to graduate school and his wife was about to give birth to their first child. We advertised for a new conductor. Al Mannino was the only one who responded positively. We auditioned him and he became our director for the next seven years. After several years at White Oak, we relocated to Robert Frost Middle School. Al was the band director at a middle school in Germantown and lived in the western part of Montgomery County. Robert Frost was closer to his area and therefore easier to drive to for him. Some of the band members from other areas found it less attractive. At any rate, Al informed the band that he would be leaving at the end of the year. He helped us advertise for a new director. Four candidates came forth and auditioned the band. We had to vote to pick our new director. Dennis Taylor won an overwhelming share of the votes. He became our director in 2005. In order to be more convenient to a majority of the band members, we moved to E. Brooke Lee Middle School. The band director at that school. J. J. Nagle, played bass in the band. After several years at E. Brook Lee, Jeffrey Johns, the band director at Northwood High School, offered the use of his band room. He also played bass with the band. We began rehearsing at Northwood in 2007. In early 2009, Dennis, a lawyer, changed his civilian job. Because of assuming additional responsibility that caused his workday to frequently extend into the evenings, he decided to give up directing the band. During the 2008-09 season, Jeff announced that his band room would be undergoing a major renovation during the summer of 2009. 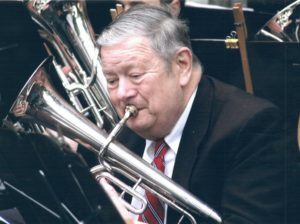 Nigel Horne, a British bandsman, had been rehearsing the band on a number of occasions over a period of several years. He expressed an interest in becoming the director. The band was certainly lucky to have him. He became our official conductor with the start of the 2009-10 season. The band has performed at a variety of places over the years. In 1976, we were invited to perform in the Smithsonian Institution on several occasions during the Bicentennial Celebration. We played in two joint concerts with the Rockville Concert Band. We also performed at the Kennedy Center as part of the Christmas season in the lobby of the theater. We performed at a number of shopping malls during the Christmas season. However, the malls became reluctant to ask us back because the merchants claimed that the shoppers stopped shopping to listen to us play. During the summer, we played outdoor concerts for the City of Rockville and at the Cabin John and Wheaton Regional Parks. For the last seven years, we have provided suitable music during the celebration of Norway Day. This commemorates Norway’s declaration of independence and becoming a separate nation early in the 20th century. We also performed at a number of libraries and retirement homes. Our most ambitious performances, however, were at the annual championship contests of the North American Brass Band Association. In 1983, we competed in the second section of the first NABBA contest held at Raleigh, North Caroline. In 1984, we attend the contest held at Westchester, Pennsylvania. Twice we traveled to Columbus, Ohio to compete. Then we went to a town just outside of Atlantic City to compete. Our final appearance was at the 1990 championship contest in Pittsburgh. We also performed at the Portrait Gallery of the Smithsonian Institution. We played for a political rally the first time Constance Morella ran for Congress in the 8th Congressional District. Throughout the history of the band, we have striven to increase the size of our music library. Our biggest acquisitions of band music occurred from 1982 through 1986. We were able to purchase hundreds of pieces at a low cost from the Boosey & Hawkes branch office in Toronto. We also made major purchases from Australia and New Zealand. At present, our library consists of about 1600 selections arranged for British brass band. In addition, we also have several hundred pieces of American brass band music that have been arranged in the British style. British brass band music has all the parts in treble clef, except the bass trombone. To adapt them to American conditions, it has been necessary to transpose the parts for the trombones, euphoniums, and basses into the bass clef. For the first twenty-five years, this was done by hand. At one point, I counted up the number of pages I had transposed and found it to total 2,000. Since it took me an average of two hours to do one page, this meant that I had spent two working years (one working year = 2,000 hours). Since 2001, Finale software has been used to make up full scores for selections that do not have them and to make bass clef parts for the lower brass.